I’ve flown with my pug Matilda several times- both on Southwest Airlines and American Airlines. If you have a small animal and are going for an extended stay, it might be more cost effective to take them with you than paying for boarding. 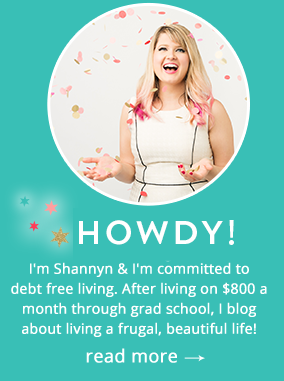 Of course, you also need to make sure where you’re staying doesn’t tack on pet fees, or that your relatives will truly not mind having an extra four legs in the house! 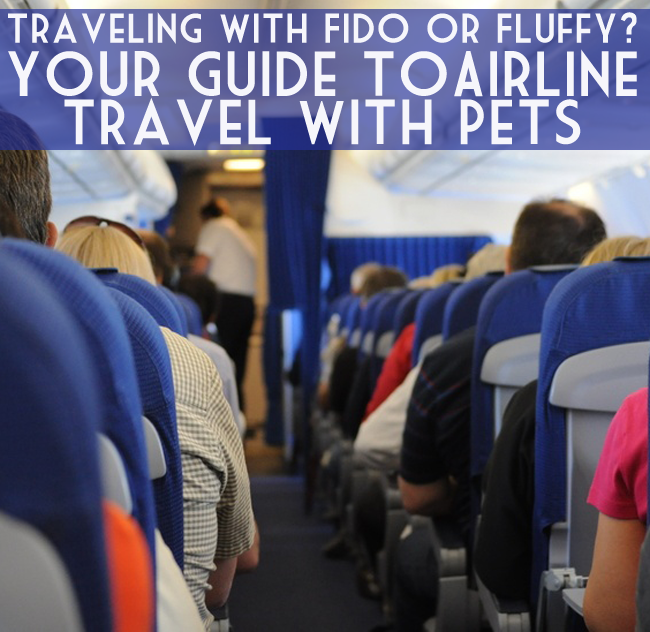 If you’re flying for the first time with your pet, it can be stressful to navigate the airline’s pet policies and find the right carrier and plan to make him or her comfortable as you travel. You’ll need to do some research as to your preferred airline’s pet policies and how much they’ll charge to tote along your pet under the seat or in cargo (which I don’t recommend cargo as we’ll get into below), but this guide should help you navigate the experience so you know what to expect! I highly recommend booking with Southwest Air since they allow for small animals in-cabin for $95 each way (sadly, up from $75 each way last year, ugh!) which seemed to be one of the cheapest, along with no baggage fees- even though the flight cost more up front, the additional fees with other airlines added up. If you’ve decided it would be more cost-effective to travel with your pet for extended stays away from home, you and your pet will need more luggage, to which Southwest doesn’t charge baggage fees for the first two checked suitcases up to 50 lbs. each….so overall, if you can get a good flight with Southwest, you’ll be avoiding the $120 each way pet fees on other airlines, along with their $25-50 per suitcase checked baggage fees, which adds up fast. Do the math though, you’d be surprised after all fees and add-ons are considered, which airline is the most cost smart. Additionally- while you can, on some airlines, put pets in the cargo hold, I highly recommend you only travel with your pets who are small enough to fit in-cabin. There have been many horror stories of animals who didn’t make the flight and has caused some breeds (including pugs) to be banned from cargo travel. For the two years I had Ralph, he was too big to fit comfortably under the seat so he had to be boarded when I traveled. If you are a fan of pugs, Boston terriers, bulldogs or other short-nosed breeds- they may be banned from cargo travel. Check your airline! I recommend Southwest for traveling with pets as their fee is cheaper, and TSA approved carriers fit with a bit of room to spare. This is a medium Sherpa bag. You’ll need to bring a dog/cat carrier that is denoted as being “TSA friendly,” and will fit under the seat. Southwest has their own brand (which, I don’t know about you, but I don’t like to pay $45 to advertise with their merchandise, if they want to send me one for free, I gladly will- ha!) of pet carriers, but you can also pick them up at Petsmart, Petco or Amazon. I highly recommend Sherpa brand pet carriers. They are easy to carry, TSA friendly and up to the medium sized carrier, they will fit comfortably underneath airline seats. I researched carriers like a fiend, because I was very nervous about getting to the airport and getting turned away- and many travelers recommended Sherpa carriers as they worked on a variety of airlines. For Southwest, you simply need to check in with your pet in their carrier and pay the fee. For American, there seems to be some time consuming paperwork, so allow an extra five minutes, depending on the swiftness of your checkin agent, to weigh the dog and charge your credit card. I have never had a problem bringing my dog on the flight, and checkin has always, thankfully gone smooth. If you’ve gone with a TSA friendly carrier, it should fit just fine, but if you go with a larger carrier,that’s still TSA friendly, you may not be able to slide them under the seat, and they may spill into your foot area…so stretch out before you sit…it’ll be cramped for any animal in a larger TSA friendly carrier (I’m guessing, over 18 lbs). After you pay your pet’s way, you’ll have to go through security. The carrier will have to go through the x-ray baggage screening like all other luggage. You will need to remove your pet, and carry it through the medal detector. Then, you should be done! I learned the hard way that not all TSA friendly carriers actually fit under the seats even if the airline says it will. 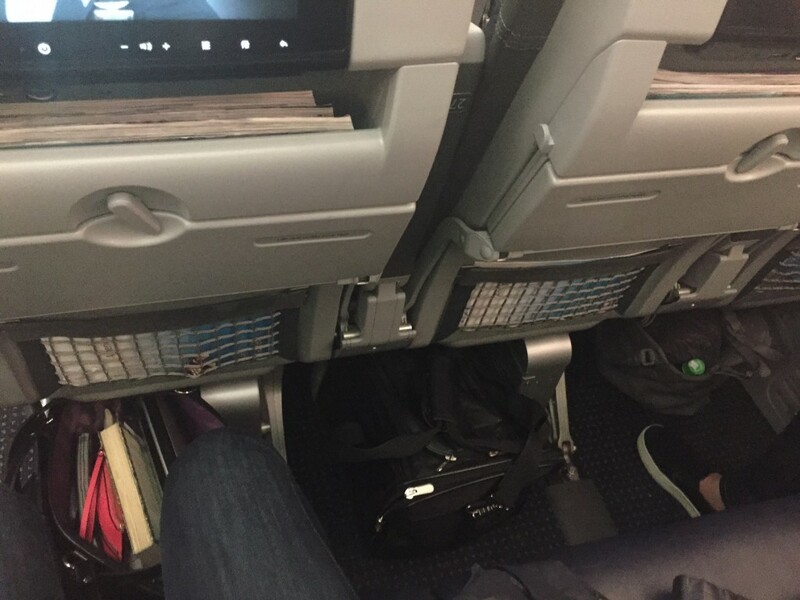 Annoyingly, on a recent American Airlines flight, I was booked on an aisle seat, which had less underseat space than the other two seats in the center or window seats. Additionally, on the newer American Airlines planes that have touchscreens have under the seat electronic boxes to power the screens, cutting down your available space. Needless to say, the Sherpa carrier I used for Matilda that fit perfectly under the seat on Southwest, wouldn’t even work on my aisle seat. Yikes. Luckily for me on that flight, the center seat was empty, so I could put her in the middle seat, but it was still a squeeze. This is why the Sherpa carrier is so good- it’s got wire to add structure, but helps squish it a little bit if need be on a full flight. I tweeted American about this problem, and they said that I should take it up with the airline flight attendants…which can be sort of stressful when you fly, to try and swap seats. Just be aware, on flights that have touch screens, this may make under the seat storage a problem. I couldn’t fit my Medium Sherpa under my aisle seat on the new American Airline planes. I had to put her in the middle seat, even though my carrier is TSA approved. 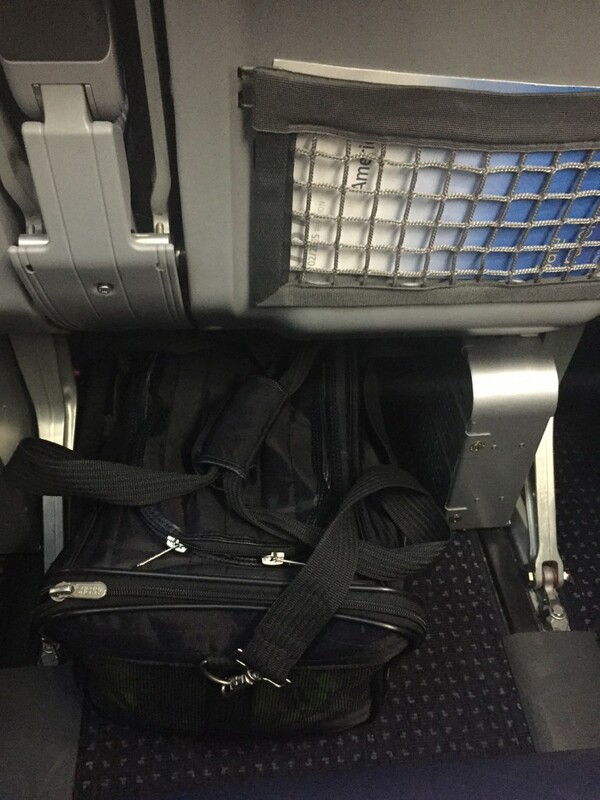 As you can see, a similar bag to the one I traveled with on my Southwest flight, it wouldn’t even fit under the seat, it was too tall, and the aisle seats have virutally no foot room with the electronic box underneath all seats with a touchscreen. It was a very, very cramped flight on the new American Airlines planes with touchscreens- be aware! No matter how well traveled your pet is, travel is stressful. Being in a cramped container is stressful. I called my vet to ask for pills to help my dog relax a bit. Plan ahead, have pills and treats ready, and give your pet a sedative 1-2 hours before you leave, or before they have to be put in their carrier (if you’re being driven by a friend or family member) en route to the airport. If you are unable to take a direct flight, you’ll want to take your dog out to relieve itself and stretch it’s legs. Be aware that most, if not all, pet relief areas are outside the airport, past security- so you’ll need to plan time to go through security during your layover to enter the airport and board your connecting flight. Plan time for this, it can be quite a walk out to the pet relief area, and security may take some time to go through. Honestly, the pet relief area has been a hike at most of the airports I’ve seen, so whenever possible- for both yours, and your pet’s comfort, book direct flights whenever possible! The first time you fly with your pet, it can be very stressful. I know the first time I flew, though I researched carriers, bought four and returned three to find the right fit, the process was relatively simple. I was so worried something would go wrong or that I would get turned away at check-in for some reason or another- but that’s never happened. Just remember to keep your pet comfortable, and give yourself plenty of time for checkin and getting around while bringing a pet- you should be fine! Haha, I imagine cats aren’t very easy to travel with. Many people choose to sedate them, but at least boarding them (or having someone petsit) probably isn’t as expensive. Interesting post! My mom and I traveled with my dog a few times when I was younger and always took her on board. The idea of pets in cargo kinda terrifies me. These are all great suggestions! It doesn’t sit well with me, either. I like being able to see her on the flight! Excellent post. I flew with my dog and was saddened that after takeoff, I was not allowed to hold her on my lap. 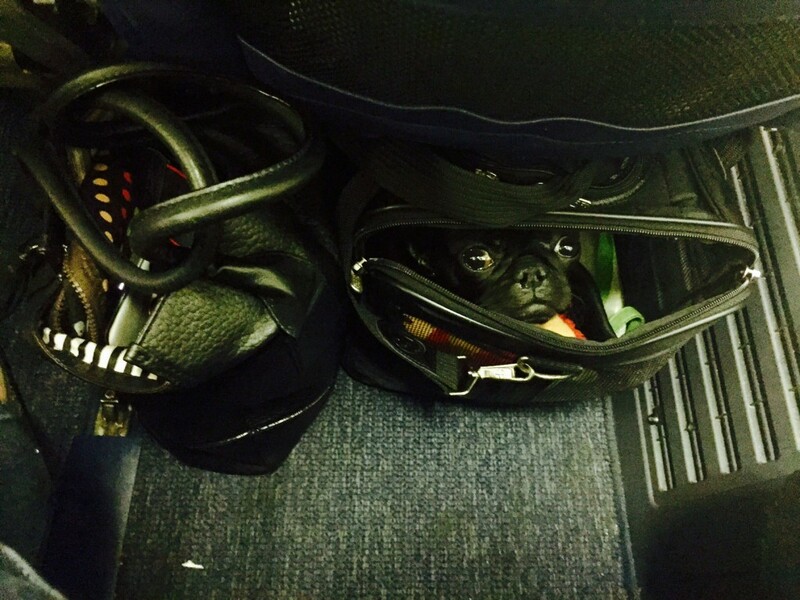 The airlines require that you keep dogs in their carriers throughout the entire flight. It was torture looking down at her and not being able to pick her up! Glad you liked it! I know, I hate packing Matilda up like that, but at least I don’t have to miss her while I’m away. I’d rather have her with me! Then again, traveling with her probably isn’t the best idea. i’m more concerned when I want to move in the future. I’m planning to move later this year too, and I have no idea how I’d get my cat through security and then back into the carrier! Hey Beks! Yes, my dog is harnessed, but that’s why I highly recommend getting a light sedative for your pet from your vet. You can imagine how nervous they’d be- when going through security and also, the barking or meowing during a flight. Matilda is a barker, and as a rescue around people, she gets really nervous. A light sedative made her rest through it and it made it less stressful on both of us. So she just napped! Great tips! I haven’t had the need (or the nerve) to try this yet with my four-legged child but I’ll definitely be prepared now when I am. Thanks! 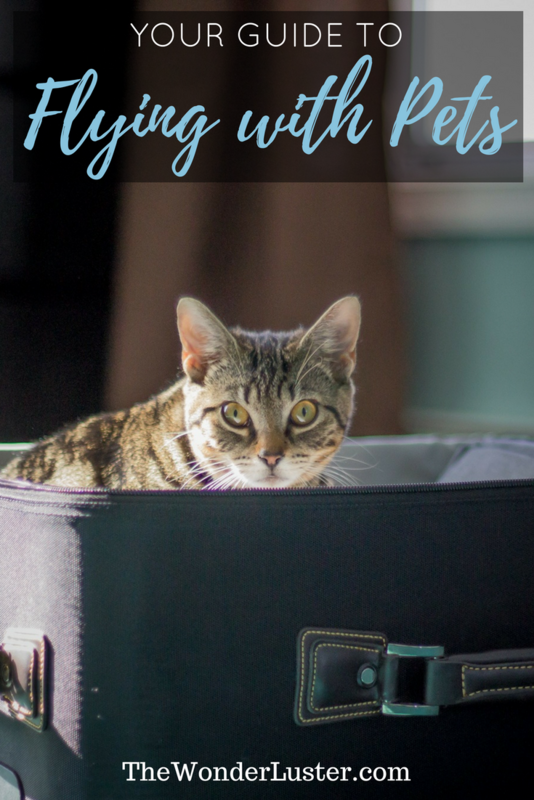 Thanks for these tips – I will definitely try to find the best flight for my cat when we move across country! You’re welcome! I hope your trip goes well. This is a very good article, on a not so well known topic. cute dog! I wasn’t aware that TSA had rules on pet carriers. I thought it was the airlines themselves. Is there information on that at tsa.gov? Hey there! Nope, TSA regulates them for security purposes, then the airlines have specific sizes, so it’s totally confusing. Typically, when you’re at the pet store, you can see if the carrier is TSA approved, to be able to get through security, then be sure to check with your airline, they have specific measurements depending on the plane. It can be confusing, so that’s why I ended up settling on the Sherpa carrier, many people had posted in the forums that they’d flown several airlines with them. Thanks for the information! I love my Sherpa carrier…although I don’t think my cats are as happy about it. 😉 I’m grateful to have a wonderful pet-sitter. Having family or friends available to pet-sit is always a nice alternative. My pet sitter is a professional whose services I gladly pay for. I can depend on them where you can’t always depend on friends and family. The high-quality service is worth the peace of mind that my furry family members are safe and properly cared for. I simply plan that expense as part of the cost of travel. I have looked all over the TSA.GOV site and can’t find anything about the regulation of pet carriers. Everywhere I look it seems to refer you to your airline. I think the TSA-Approved thing may be a sales gimmick. 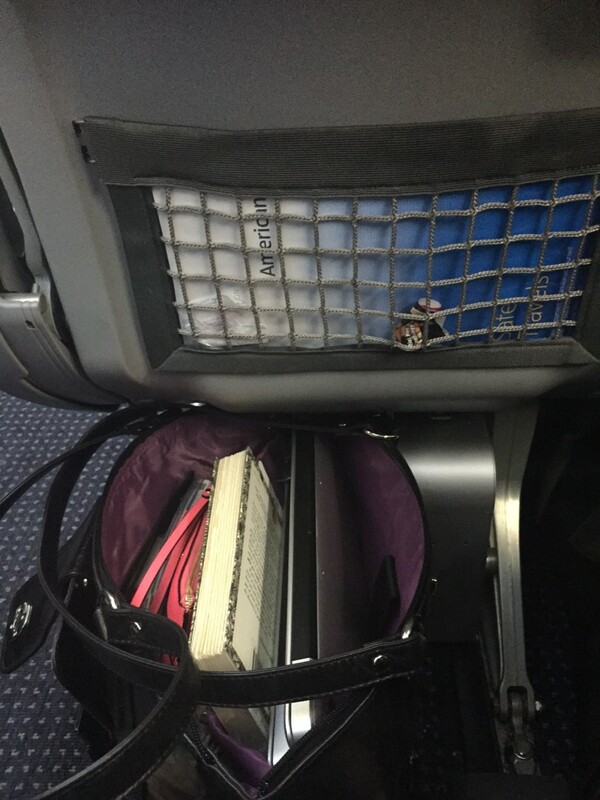 I got stuck in the aisle seat accidentally once too – on some planes that space is so small there is hardly any room for my legs, let alone the dog carrier! The middle seat usually has the most under-seat space. I thought I would mention that some airports have indoor dog facilities (meaning you don’t have to exit through security – amazing when you’re short on time! ), including: San Diego, Chicago O’Hare, Detroit Metropolitan, Washington D.C.’s Dulles International Airport, Seattle-Tacoma (SeaTac), Minneapolis Airport, Dallas Fort Worth, and Pittsburg. so I’m flying america with med. sherpa next week, so go for the middle seat? Great points on traveling with your pet…I am not a fan of any sedation on the plane because the altitude and sedation can be an issue with animals. There are a lot of natural remedies like lavender essential oils and other pet calming products that work nicely. Delta no long flies pets…United pet care (United airlines) they only do pets so for people with larger animals they are pretty good. During the winter time they seem to have a lot of weather delays but they get to their destination …another trick to fly with you pr pet is to have plastic baggies, gloves and a recycle bag to clean any unexpected messes. They also have a TSA harness for dogs so you don’t have to unleash them- amazon….make sure you practice using the carrier before you fly to lessen the anxiety.. I have a Facebook page called Pet Imports Saudi Arabia and I help import and export animals to and from Saudi..I charge nothing I merely provide the information. Thanks for your article….pets rock!